Whether you are looking to gain weight to add some healthy curves, bulk up at the gym, or you are just trying to change how you look and feel, snacking is essential to getting those extra calories throughout the day for maximum weight gain. We live in a world of convenience and that goes for our snack foods too! While taking CB-1 Weight Gainer you’ll notice your appetite grow and you’ll feel hungry more often. This means you’ll really want to have some quick, high calorie foods on hand. We recommend easy, on-the-go snacks such as granola bars, chips, fruit cups, celery and peanut butter, or pre-packaged lunch kits. Nothing says “complicated” like melted food all over the car seat, especially when you’re in a hurry. We suggest avoiding messy or complicated snacks to make your life simple. It is important to keep high calorie foods within easy reach and, thankfully, there are plenty of ways to do that. Try one of the convenient insulated snack boxes that will hold all of your yummy snacks or a simple ice pack for optimal freshness. 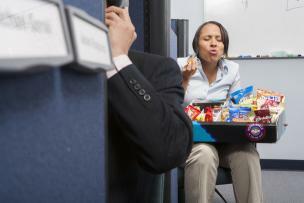 Convenient snack-packs like crackers and cheese or pretzels and peanut butter have always been a caloric favorite. The more calories you can consume during the day, the better your weight gain success. Along with your CB-1 Weight Gainer, we recommend weight gain snacks that are not only simple and easy but high in calories to make your snacking time really count. The Supragenix Weight Gain Shake makes for a great calorie dense snack since it can add an extra 510 calories per serving to your daily calorie intake. A little preparation goes a long way. Save yourself time and energy by shopping with a grocery list and keeping your kitchen stocked with high calorie foods. Set some alarms to remind yourself of when to eat meals, when to eat snacks, and of when to take your CB-1 Weight Gainer. By just spending some time once a week in meal and snack preparation you can give yourself the best chance for success. Snacking is a great way to keep energy levels up for your busy day and also to add those additional calories necessary for your weight gain. The extra calories you consume throughout the day, coupled with CB-1 Weight Gainer, will lead to faster weight gain results. By following these snacking tips you can easily set yourself up with a great habit of quick and simple snacking to meet your weight gain goal.